There are many martial arts in the world such as Hapkido, Taekwondo, Jujutsu, Karate, etc. Although featuring of each one, we introduce the two martial arts, Hapkido and Taekwondo. The meaning of Taekwondo is Tae "to strike with the foot", Kwon "to strike with the hand" and Do "the way". Taekwondo is focused primarily on kicks, punches & strikes and forms. Hapkido has a huge following as a practical and extremely effective method of self-defense. Hapkido is a form that employs joint locks, pressure points, throws, kicks, strikes, and may also include various take-downs or sweeps. Hapkido practitioners train to counter the techniques of other martial arts as well as common "unskilled" attacks. Hapkido and Taekwondo are both from the country of Korea. They are the most popular martial arts of Korea. Although they look similar, they are very different. 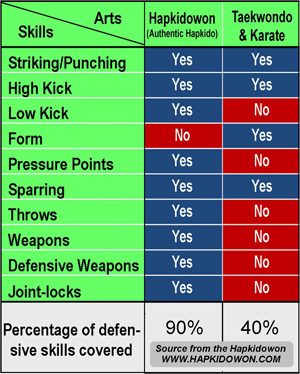 Taekwondo kicks above the belt only. however Hapkido kicks are characterized by fluid and dynamic high, middle, and low attacks everywhere on the body. Taekwondo (and Japanese Karate) striking and punching is hard, stiff, and straight in motion it will make body rigid and hard, it is comparative with Hapkido punches which are soft and round in motion. Hapkidowon is the best system based on authentic Hapkido! click here to go to Hapkidowon.com. 387 Magnolia Ave # 101, Corona, CA 92879.